If you want only the best in window fashions, you’ll find it in the the Alustra Collection from Hunter Douglas. Considered a high-end window covering in both style and craftsmanship, Alustra offers unique fabrics, finishes, and decorative details. The exclusive Alustra Collection of custom window shades, shadings, sheers and blinds is a premium selection of window treatments only available from a Hunter Douglas gallery such as Treasure Coast Window Fashions in Stuart FL. Take a look at this video to find out what you can expect from the Alustra Collection. The Alustra Collection is designed for those who want to surround themselves with the finest. Available only through the nationwide network of Hunter Douglas Window Fashions Gallery® dealers, including Treasure Coast Window Fashions serving the West Palm Beach, Jupiter and Stuart areas, The Hunter Douglas Alustra Collection offers consumers a high-style product collection based on proven, time-tested products and distinguished by exclusive fabrics, unique finishes, new dimensions, innovative systems and distinctive accents. 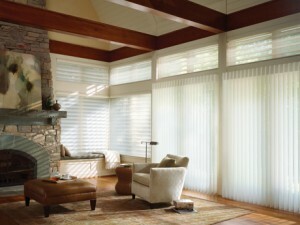 Alustra window fashions include many different products, from privacy sheers to honeycomb shades. Alustra window treatments from Hunter Douglas can be easily motorized using the innovative Platinum 2.1 technology. This remote control automation system can be installed on all new Alustra installations, or added to existing window coverings. Available with the cutting edge Platinum App for iPads and iPhones, it’s never been easier to motorize and control your window fashions.